From 1900 to 1913, filmmakers Sagar Mitchell and James Kenyon, commissioned by touring showmen, roamed the North of England, Scotland, Ireland and Wales filming the everyday lives of people at work and play. For around 70 years, 800 rolls of their early nitrate film sat in sealed barrels in the basement of a local shop in Blackburn. Miraculously discovered by a local businessman and painstakingly restored by the BFI, this ranks as the most exciting film discovery of recent times. 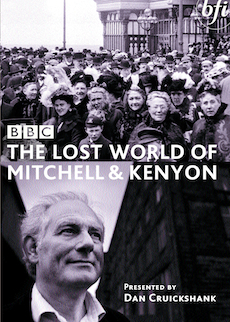 The BFI and the BBC have collaborated on bringing this fascinating material onto the screen with a three-part television series, The Lost World of Mitchell & Kenyon, was broadcast on BBC Two in 2005. Presented by Dan Cruickshank, the series opens up our past and includes interviews with descendents of some of those featured in the footage, who are seeing their ancestors on film for the first time. It also boasts a world exclusive: the first ever film of Manchester United. The films are discovered by Peter Worden and restored by the BFI's National Archive. The story of Mitchell and Kenyon begins with bustling streets at home and controversial war abroad. Following changes to working hours won by organised labour, the British worker enjoys new leisure time, swelling crowds at football matches at Preston North End, Liverpool and Manchester United. People flock to holidays in Blackpool and to egg tosses at home. To conclude this extraordinary series, we see the first ever crime reconstruction film, the success of Mitchell and Kenyon in the USA and the ultimate demise of their partnership.